NPR's Frank Tavares, Shemika Secrest, and André 3000. A hodgepodge of individuals, until Capital Cities brought them all together for "Farrah Fawcett Hair". 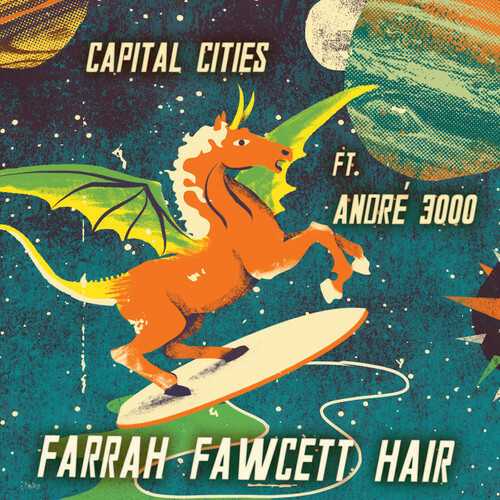 Serving as another enticing single off of Capital Cities' debut album, In a Tidal Wave of Mystery, "Farrah Fawcett Hair" lives up to the fun, poppy, and oh-so-infectious sound that Cities is known for. Thrown back in time to my elementary school days (you know how your parents listened to NPR while you were in the backseat) with that distinct voice of Tavares, I couldn't help but wonder what was going to happen next. Lo and behold, chopped vocals establish a quick tempo that is filled with keyboard notes before settling into a thriving and sweeping melody. Once André 3000, who makes rather surprising appearance, comes in after an invigorating trumpet solo, you should be up and out of your seat. The track is eclectic, catchy, but more than anything distinctly Capital Cities. If you haven't had a chance to listen to In a Tidal Wave of Mystery which was released via Capitol/Universal Records and Lazy Hooks this past Tuesday, June 4th, then I suggest you grab and add it to your summer playlist. http://t.co/MuRoPADGvV una nueva canción de Capital Cities.